A couple of months ago a friend loaned me a book he thought I would want to read. It has been sitting on my shelf of candidates until today. I picked it up this morning thinking that endurance seemed like an appropriate theme for today. I began reading around lunchtime and finished it this afternoon. It is a quick and compelling read...difficult to put down. Dean Karnazes has run the Western States 100 Miles Endurance Run, has won the Badwater Ultra marathon in Death Valley, California (135 miles in 120 degrees Fahrenheit temperatures), and was the first man to run a marathon to the South Pole (without snowshoes). He even ran a 199 mile relay run BY HIMSELF...3 times...to raise money for sick children. Karnazes understands sacrifice...endurance...passion. 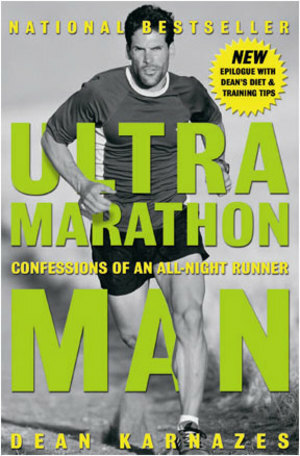 This is not a book for runners only...not even for athletes only. It is a book for anyone who wants to live life...to really live it...fully...fully alive. Anyone who has known the experience of pushing his or her body beyond that which was previously perceived to be possible understands that much of the battle is mental...and emotional. Lessons learned on the race course translate to life in general. I have included a few favorite quotes....just a sampling...pieces and parts. Thanks, Kyle, for a great read. "If it comes easy, if it doesn't require extraordinary effort, you're not pushing hard enough: It's supposed to hurt like hell." "Don't run with your legs. Run with your heart." "Most dreams die a slow death. They're conceived in a moment of passion, with the prospect of endless possibility, but often languish and are not pursued with the same heartfelt intensity as when first born. Slowly, subtly, a dream becomes elusive and ephemeral. People who've let their own dreams die become pessimists and cynics... 'It can't be done,' they'll say, when you describe your dream, 'It'll never happen.'" "It struck me in the space of a few steps that my past as I knew it had suddenly ceased to exist. Nothing would ever be the same to me from this point on. I'd been transformed by this journey, in ways I had yet to understand. This person who was staggering and crawling and persisting at mile 99 was a different being than the guy who had started the race just yesterday morning. I was more capable than I imagined, better than I ever thought I could be. This realization was like stepping into another dimension. Covering 100 miles on foot was more than a lesson in survival, it was an education on the grace of living." *Originally posted 27 August 2007.